Johnny. . Wallpaper and background images in the Johnny the Homicidal Maniac club tagged: nny jthm homicidal maniac nightmare johnny. 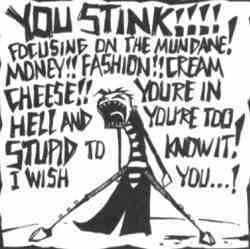 hey johnny, i don't even like cream cheese,money, i'm a punk rocker so i don't care about fashion,and what exactily is "mundane"?